Welcome to my Fall Home Tour Part 11. 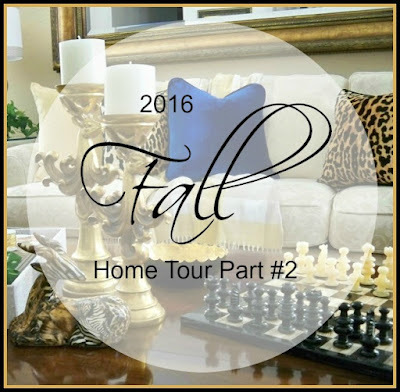 A few weeks ago I shared Part 1 when I hosted the 2016 Fall Home Tours with 30 fabulous ladies opening their homes and delighting us with their beautiful fall decor. If you missed any of those you can check them all out here. I shared several rooms in the first tour, but today I am showing a few changes I've made to the living room. I rarely use a lot of saturated color and I am not a real huge fan of blue in my decor, but this royal blue velvet was just so lush I couldn't resist venturing out of my comfort zone a little. This fabric is a really fun happy accident. I ordered some fabric online and somehow my order got mixed up with someone else and I got a bright shocking pink and this fabulous royal blue. Well they were so wonderful that I kept them both. With just a few pillow changes and swapping out a few accessories, I have a whole new look. I played off the leopard pillows and added a few more masculine accessories to create a version of an upsclale "man cave". I added fanciful candlesticks, a stylish gazelle and a chess board to the coffee table. The deep lush blue on these velvet pillows just draw you in and would make any man feel comfortable. This Gazelle figurine wearing all kinds of animal prints was a fun thrift store find. He's wearing just about every animal print there is. I think he adds tons of character to the coffee table. The men in my family are all chess players, so I set this marble set up for them. This is something my hubby and grandson will use every time they get together, so now it is set up and ready. The end table in the background continues with the wild kingdom theme. Plants always make every arrangement prettier and I love this little votive candle holder too. Just enough color and spice. This room definitely has a more masculine feel now. With just a few tweaks I decided to add a small tablescape to the dining table. I just usually have a centerpiece on the table, but a few placemats and a tablesetting has it all ready to get together with friends this weekend. Leopard placemats compliment the leopard pillows on the sofa. A simple place setting is all we need for a casual meal. I think we will just grill some steaks and have a fabulous fresh salad. This is the centerpiece that I already had, feathers, grass and berries. I will remove it when we eat. That's it for the dining area, just a casual setting to compliment the living area since they are all one room. Thanks for stopping by for my Fall Home Tour Part 11. I always love having you here and be sure to check out my Part 1 too. Maybe I should use bold colors more often, what do you think? Marty, your home is so welcoming and lovely. May I ask where the leopard placemats were purchased. Just love them! I've had them for years, but I think they came from Ross. I did find some on Overstock - - -https://www.overstock.com/Home-Garden/Leopard-Round-Placemats-Set-of-6/5107007/product.html Super price $10 for 6. Marty, so tastefully done! Love the animal prints. The blue pillows are rich looking, and a definite plus to your room. Love how you did this. Beautiful blue color! The mix with the blue and animal print is fun, do you have any blue napkins to use on the table and bring just a touch of it over there? or maybe blue napkin rings would be less in your face blue than napkins? No, I don't have anything blue, so I just went with the camel color. I really never have used blue in my home, so if I am going to use it more often then I need to buy some napkins. I just used what I had. I love that gazelle! Your room looks fabulous! You know I love the leopard, I have a touch of it in many rooms! Happy October! That pillow is an amazing pop of color. I love the gazelle. How fun is he? Hi Marty! Everything is just beautiful. Everything! Hope you've had a wonderful weekend. Beautiful, Marty! I've got to find myself some pretty feathers! You are the best with blending whimsy with elegance. Just beautiful all of this. Love the gazelle so unique. Hugs and have a super week. That blue is a headturner. I can see why you kept it. This is a rich an unexpected color that I'm not seeing everywhere which makes me love it even a bit more. #Happy mistakes. I'm inlove with the pop of blue and the new gorgeous vignettes! I love the unexpected royal blue among your decor. Your home is beautiful as always! Love the cobalt blue mixed with the leopard! I say yes to the BLUE!! No surprise there!!! Marty, I love all of your animal accessories. They make everything look so sophisticated. Your table setting looks so pretty. That centerpiece is stunning. Gorgeous tablescape. You always have the lovelies homedecor. Thank you for sharing at Dishing it and Digging it link party. Hope you will stop by again this coming Sunday. Have a great week. I love the color combo of the blue and the animal prints. Unexpected, but totally works. You did a fab job!